Puli beats Yennai Arindhaal in Tamil Nadu on Day 1. 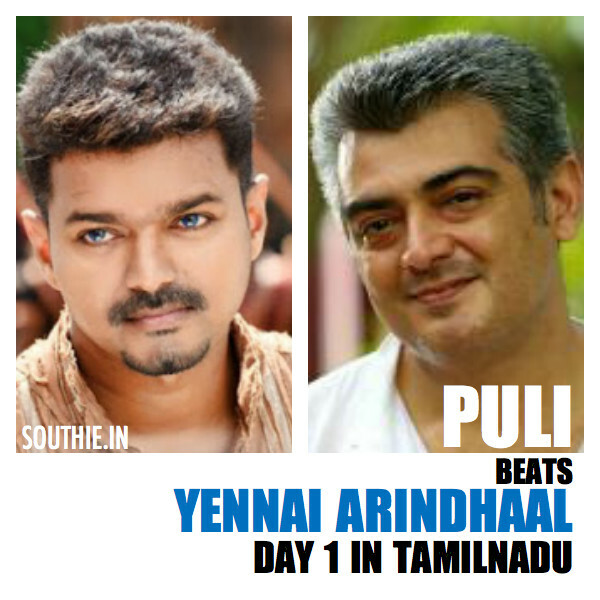 Home/NEWS/Puli beats Yennai Arindhaal in Tamil Nadu on Day 1. Puli beats Yennai Arindhaal in Tamil Nadu on Day 1 without benefit shows and tax benefits. Vijay’s Puli only in Tamil Nadu has Rs 9.27Cr nett collections and Ajith’s Yennai Arindhaal had Rs 8.31 crore nett collections only in Tamil Nadu. This is the second best opening for Vijay in his career. Puli has opened to Massive numbers in Tamil Nadu. The movie had faced some troubles and could not have benefit shows and morning shows, and there are no tax benefits for Puli. Here is a break up of Puli Collections on Day 1 only in Tamil Nadu.